I stumbled across Poison early in high school, and I loved it so much I went on to read whatever other works of Chris Wooding that I could get my hands on. For years I remembered Poison to be this incredible, fascinating novel, so when I picked it up again as an adult I was a little apprehensive. But I loved it just as much, if not more, than the first time I read it. 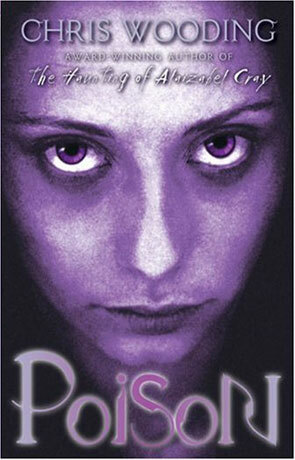 Poison is Young Adult Fantasy. It follows Poison in third person narrative, a willful girl who lives in the Marshes, where nothing changes and everyone remains the same. Poison’s sister is snatched by the Scarecrow and she must leave the Marshes to seek out the Phaerie Lord to get her back. She finds herself in an unfamiliar city, in the home of the Bone Witch, and then in the Phaerie Realm, struggling against powers larger than herself. This book is gripping and deliciously dark. Wooding takes fairytales and folklore and wraps them up in gruesome monsters and sinister characters, tossing a scathing cleverness overtop of it all. In her journey, Poison faces morbid creatures, from witches to spiders, and Wooding’s writing has the reader sitting at the edge of their seat, nervously glancing up at odd creaks in their own home, or sudden blurts of conversation in a coffee shop. So much of the unreal happenings seem very, very real when the reader is engrossed in Wooding’s words and Poison’s adventures. Poison, as a character, is refreshing. It was great to see a Young Adult book with not just a strong, capable female lead, but also no romance or love story. Poison is easy to cheer for and easy to love. I found it fairly impressive that Wooding weaved a believable female character who wasn’t unfathomably strong but strong in her own way—Poison struggles, fails, and needs help along the way. She is terrified at the menacing creatures she faces, but she goes on despite that, fueled by her desire to see her sister returned home. What is amazing about this is the abundance of Mary Sue’s in novels of all sorts (Twilight’s Bella Swan as the biggest baddest example), and how Poison is a real person. She isn’t overly characterized, she doesn’t act like a woman but like a girl, yet she still retains an inner strength and wisdom that isn’t unfathomable. Wooding really hits gold with her. Poison could be easily brushed off as a strange, grim fairytale, but there is so much more to it. Despite the fact that it is a Young Adult novel, there is a lot that older readers can get out of it. There’s symbolism and there are analogies to our lives and how we choose to live them. I has chills up my spine the entire book, but especially at the end. The sharp description and the twists and turns quickly turns something that might seem philosophical into something disturbing and fairly frightening, but nonetheless intriguing. Poison is much more of a thoughtful book than it seems on surface level—this makes it a great, gripping read for readers of all ages. Written on 4th January 2013 by Vanessa.